I listen to a lot of podcasts. Most take the format of an intelligent conversation between two or more people, or someone telling a good story. 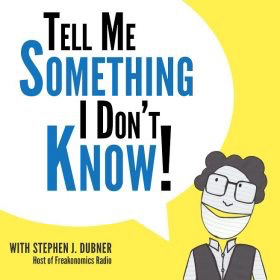 Then there’s the program called Tell Me Something I Don’t Know, which the producers (who also do the more conventional but also excellent Freakonomics) describe as journalism wrapped in a game show package. On most segments, they have a panel of three very smart people and a general theme. Audience members (often experts in a specific field of study) are then invited on stage to tell the panel about something they may not know related to the theme. The panel gets to ask any questions they might have and, after all the stories have been told, they decide who did the best job. It’s all simple, very nerdish fun. However, as I was listening to a recent episode, it struck me that this is very much what school should be. Currently, in most classrooms, a teacher stands in front of a group of students dispensing information. Or at least they direct the distribution of that knowledge in some way. So, what happens if the teacher walks into the classroom and instead challenges the kids to tell me something I don’t know? There would have to be some structure, of course. I’m pretty sure teenagers could reel off a whole lot of trivia they consider interesting that would baffle most adults. But the show itself provides some of that organization. The rules of the game are that the IDK (short for the “I don’t know”) presented must be something we truly don’t know, something that is actually worth knowing (which may eliminate everything on the E! channel), and something that is demonstrably true. Ok, there are probably more than a few details that need to be worked out before anyone puts this idea into practice. But what better way to get students to look at learning in a different way than to ask them to choose a topic they find interesting, immerse themselves in the details, and then put the material they find into a compelling form for a live audience?